BIG NEWS! This month officially marks ONE YEAR since I started this here blog. It’s Cheat Day Everyday, my baby, is officially one year old and I thought it would only be right to celebrate with a bang. A guilt free, low calorie bang of course. 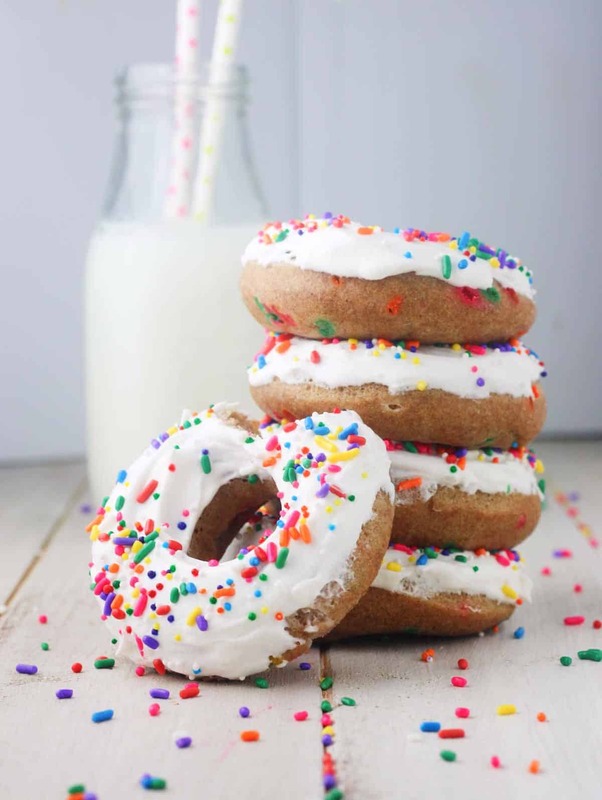 These Skinny Whole Wheat Birthday Cake Donuts are the perfect fit for such a fab occasion! Before I dive into all the goods in this recipe (spoiler alert: there are tons), I wanted to inform you guys that I’ve done something slightly different. So, now back to these oh so amazing “you will never believe they are under 100 calories” donuts. No, that wasn’t a typo. I will openly admit that I spent a good deal of time in the kitchen, whipping up batch after batch of recipe flops before I finally arrived at the perfect combination. You see, creating delicious oven baked Birthday Cake Donuts is the easy part. However, keeping those calories down to a number that won’t make you contemplate your life decisions before 10 am is the real challenge. In the end, I found that the perfect solution consists of a Greek yog for butter substitute and a dash of Truvia Baking Blend. Preheat oven to 325 degrees F. In a medium bowl, combine the flour, Truvia Baking Blend, baking soda, salt and cinnamon. In a separate bowl, whisk together the eggs, Greek yogurt and vanilla. Pour into the dry ingredients and mix thoroughly. Add the 2 tsp sprinkles and gently mix. Transfer batter to a Ziploc bag and cut off one corner. Pipe the mixture into 8 individual cavities of a well-greased donut pan. Bake for 12-14 minutes or until a toothpick inserted into the center comes out clean. Allow to cool completely before topping each donut with 1 tbs lite whipped topping and 1 tsp rainbow sprinkles. Donuts can be refrigerated in an airtight container for up to 5 days. Frost when ready to eat. Have you thought of adding cacao powder to the frosting mix? I wonder how that would turn out? Or drizzle PB powder mix on top.... sorry I’m getting so hungry looking at these pics!! For the lite whipped topping do you mean lite cool whip or lite frosting? What brand/type did you use? muahahaha! you're awesome. I have all these ingredients at home. These look amazing. Interested in another challenge? How I veganize these (and keep the calorie count+deliciousness). I'm thinking either flax eggs or bananas will take care of the egg so I've got that, but what do I substitute for the yogurt? Got any ideas?! I'm a sucker for a challenge, Elizabeth! 😉 I'm thinking that you could definitely get away with a 1:1 substitute of unsweetened applesauce. The Greek yogurt is used in this recipe to add moisture and applesauce is also great at doing this. I've actually used it in place of yogurt for many muffin and bread recipes. Hope this helps!! Wow these donuts look SO good. I love that they are a healthier way to enjoy a decadent treat, and your photography is on POINT girl. I've been having a sweet tooth for some ice cream! Might go get some today ! These are SO cute - perfect for birthdays, and it's literally insane that they're under 100 calories! These look super yummy!! I've got t get me a donut pan!! I'd been putting if off for years, but so happy that I finally caved a few months ago. They're so much fun! Honestly wanting to try these over here! May have to step out today and buy the stuff to make these! I LOVE the sprinkles! So festive! Thank you! Sprinkles are always a good time!